Cysts are empty spaces or cavities in the jaw bone with a thin lining and fluid inside. Cysts may occur in upper or lower jaws. The majority of cysts of benign and are associated with teeth, referred to as odontogenic cysts. 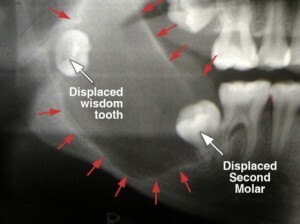 They are asymptomatic in most patients and are usually discovered during routine dental examinations. Pain and swelling may develop if cyst becomes infected. Although most are benign, cysts can grow and cause significant destruction of the jaw bone and surrounding teeth. Some cysts may transform into more serious and aggressive lesions. Dentigerous cyst: A benign cyst that can occur with any impacted tooth. Odontogenic keratocyst: A benign cyst that can occur with any impacted tooth. It has higher recurrence rate after removal. Primordial cyst: A benign cyst that occurs where the tooth did not form. Periapical cyst: An inflammatory cyst related to a tooth that has lost its pulp vitality. Lateral periodontal cyst: A benign cyst that occurs on the side of a tooth. Ameloblastoma: A very aggressive and serious cyst that can cause severe destruction of the jaw bone, teeth, and surrounding structures. Biopsy: A sample is obtained from the lesion to establish diagnosis. If the cyst is very large, a small section of the cyst maybe removed to establish diagnosis and then plan for definitive treatment. If the cyst is relatively small, it can often be removed (enucleation) completely as part of the biopsy procedure. Bone graft: If the size of the cyst is significant or it is in proximity of other teeth, bone grafting at time of cyst removal may be recommended. This allows for a more complete healing of the bony defect, particularly important if in area of possible future implant. Per biopsy report, additional surgery may be required.